Continuing with the three key things you need to do in regards to delivering projects successfully on your way to establishing IT credibility, , , this is Step 2 of 3. 1. Build an appropriate project schedule and manage projects to deliver on time, within budget and meet your client’s expectations. 2. Communicate the status of active projects. 3. 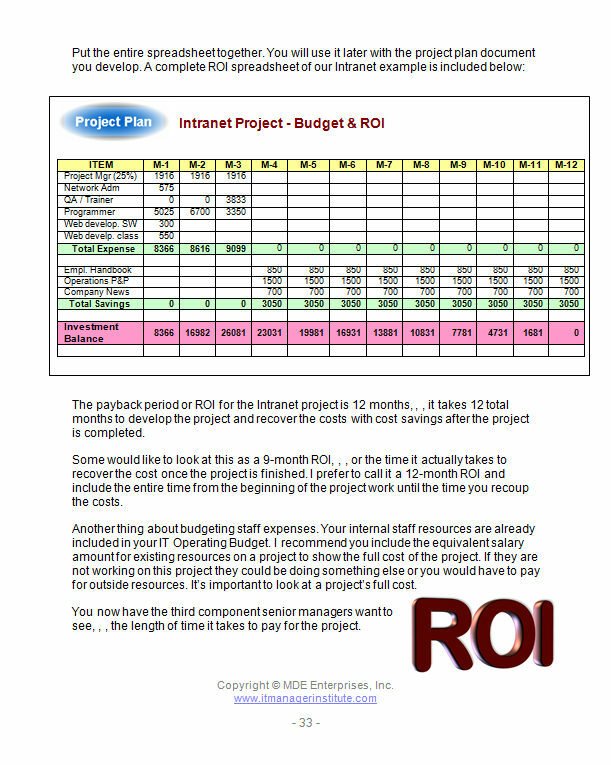 Demonstrate your organization’s project success rate and the benefits derived from your efforts. 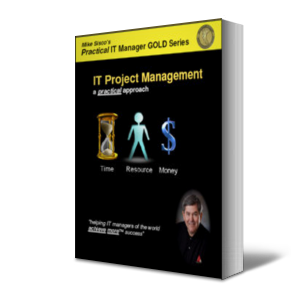 At any given time, your IT organization will have several active projects. It’s obviously important for you to execute and complete them successfully, , , on time, within budget and meeting client needs as we talked about for Step-1 in the last article. It’s also important for you to keep interested parties aware of where you are and what’s going on in your IT organization, , , specifically senior managers of your company. You must communicate effectively. Let me share a recent experience. Last year I took on a consulting engagement to provide interim IT management services for an organization while they looked for an IT Director. When I got there it was clear there were many projects in the works. What was not clear was that there was nothing in place so we could see the landscape of active projects. What I mean by this is that nothing was in place so we could even tell how many projects were underway or being positioned to get started. As I mentioned in the overview article, this is like trying to drive blindfolded, , , pretty much impossible to be successful. 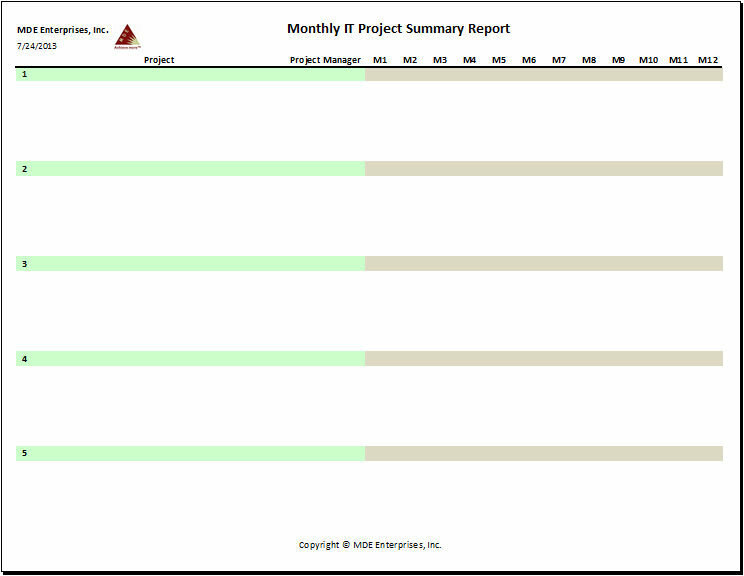 Understanding the need to be able to see the active project landscape and to communicate the status and key issues of each project, I quickly developed a simple monthly Project Summary Report. In fact, I think I developed this the first week I was there because I needed to know what was going on. When I completed my initial discovery work and finished the report for the first time it showed we had over 30 projects underway. It was a surprise to some. Over the next few weeks we discovered even more projects so the actual total was over 40 active projects being worked on or projects that were getting started. Here is a blank form from the one I created. Click on the image for a closer look. Let’s go through it so you better understand how effective this simple tool can be in communicating the status of active projects. 1. Project Name – Descriptive name of the project. 2. 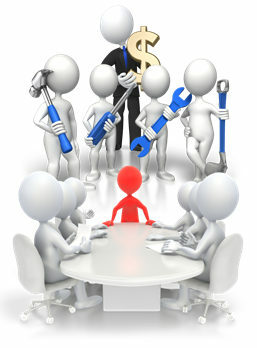 Project Manager – Who you look to for additional information and who is accountable for the project’s success. 3. Key Issues List – Below each project name there is room to list up to 6 key issues or important comments for each project. 4. Timeline – I used the area shaded in beige to show milestones that I thought important enough to communicate. I’ll give you an example in just a minute. 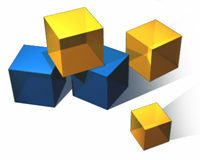 We had all types of active projects underway, , , big ones, smaller ones, , , projects that involved many people to projects that involved very few people, , , expensive and not so expensive projects, , , and projects that would take many months to complete to those that completed in just a few months, , , all types. Many of our projects required 4 to 6 months or longer to complete. For these, I felt it important to be able to communicate certain milestones. For example, if we were installing a new software application, I wanted to show the installation date, file build time frame, testing and training time frames and targeted Go Live month. First thing to notice is that I updated the month cells to reflect current time frames.In this sample, I just made up two fictitious projects and used upcoming months for 2013 and 2014. Under each Project name are the key issues I think need to be communicated. You can use any color code you desire, , , the important thing is that this helps you see the key timeline milestones of each project as well as the key issues for each project. 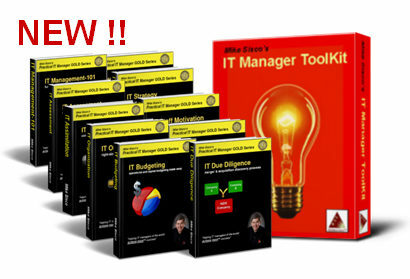 Not only will this simple tool help you stay abreast of what’s going on in your IT organization, it’s a great aide in communicating IT project activity to others who need to know, , , including your boss. 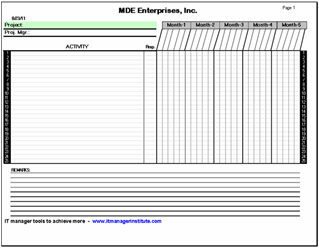 Another thing you can do if you want to be able to view everything on one or two pages is that you can copy your workbook to a new one and delete all the key issues rows to create a higher level summary of all projects. This is great for senior executives because they usually aren’t so much interested in the key issues as they are in just having an idea of what the IT organization is working on. What I’ve found to be the easiest is to update the workbook that includes the key issues. Then, when you are done with updating it copy the entire workbook to a new tab called “Executive Summary” and then strip out the key issues rows. It’s quicker and insures both worksheets are consistent with one another. This tool is simple and quick to start using. More importantly it helps you communicate every month where you are and what’s going on in your IT organization, , , something you cannot afford to neglect. Effective communication contributes to IT credibility as much as completing the projects successfully, , , both are required!! 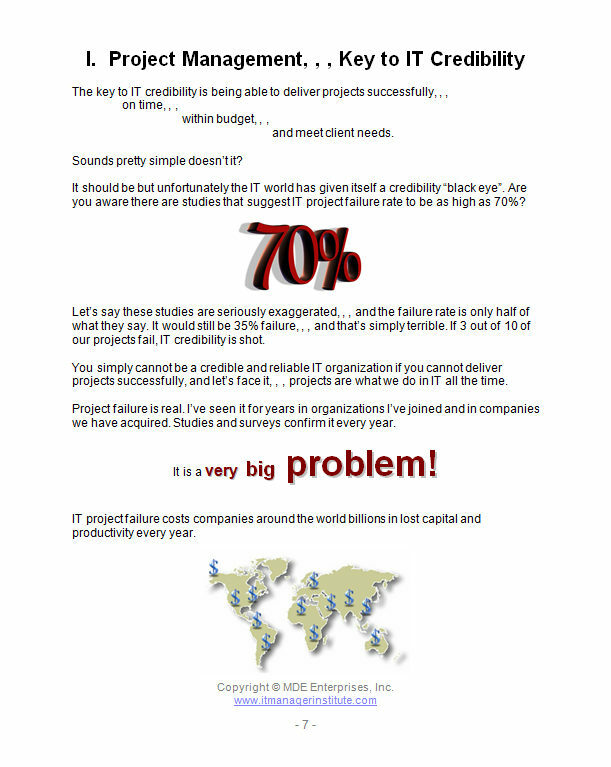 In the first article of this “IT credibility through project success” series I outlined three key components required of you in delivering projects successfully in order to gain IT credibility. In this post we will discuss the first component – building an appropriate project schedule and managing projects. One of the biggest reasons projects fail is because IT people do not clearly define the goals, objectives and specific deliverable of a project. We charge off to do the work before getting it all defined and agreed upon by the project sponsor, , , when this happens, the project is already doomed. Conduct a Project Kickoff Meeting to get project team members on the same page and to set their expectations on what you expect from them. It may be their first real project so spell out in clear terms that you expect them to have their tasks completed on time. Explain to the team that asking for help is a sign of strength, not weakness. IT employees don’t like to ask for help, but asking for assistance early gives you an opportunity to overcome something that might cause the project to be late or over budget. Projects don’t get completed on their own. Good project managers anticipate early and often and they push the project along by having weekly project status meetings to keep their projects on target. Identify key bottlenecks or critical tasks in the project and get after them quickly. These are the culprits that jeopardize completing projects on time. 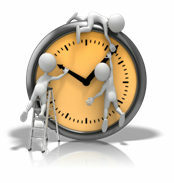 Hold project team members accountable and expect them to complete their tasks on time. In the Project Kickoff Meeting, get commitments from everyone that they can complete all their assigned tasks by the designated due dates. Inspect, , , inspect, , , inspect. Remember, what gets inspected gets done. 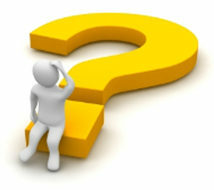 If you are surprised to discover someone is late on a task at the status meeting, , , shame on you for not inspecting. 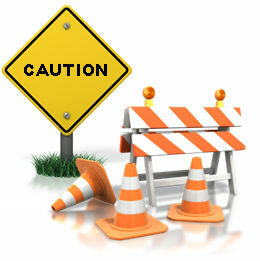 If you don’t inspect, you will always be surprised and surprises usually spell trouble. Managing client expectations is a key ingredient for project success. To do this, you must communicate effectively and regularly. 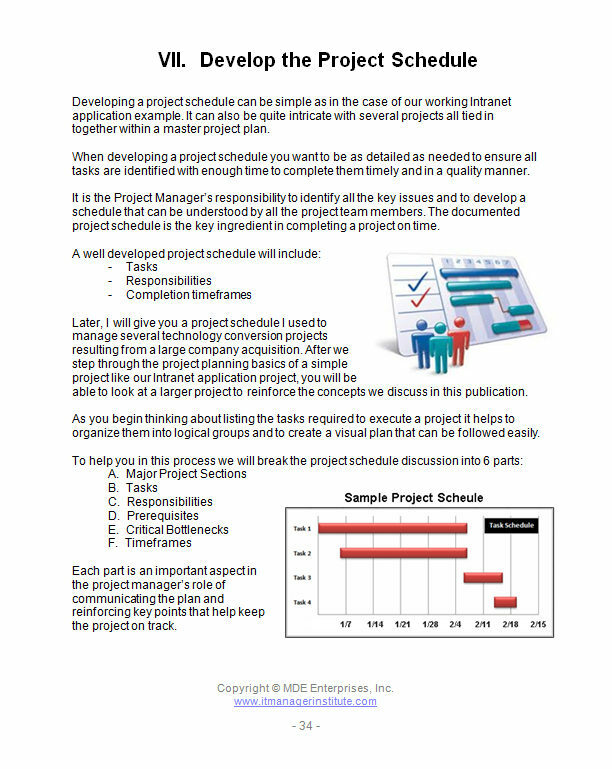 Developing an appropriate project schedule and using it to manage the project is key. 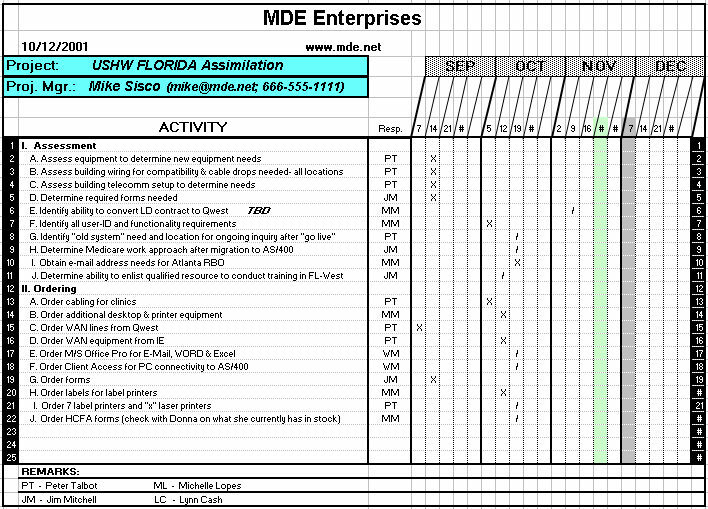 I use a very simple tool to develop project schedules. It’s an Excel spreadsheet template. I’m experienced with Microsoft Project but I’ll always revert back to this spreadsheet tool whenever possible because it’s quick and easy. 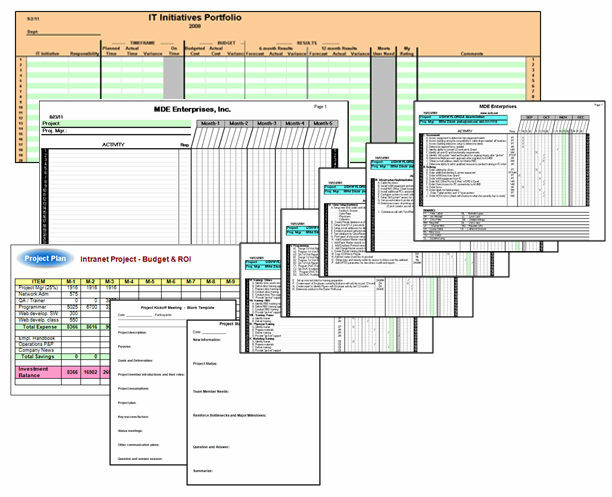 Believe it or not, before we had laptops and spreadsheets I used a paper form similar to my spreadsheet template and a pencil (and eraser 🙂 ) to manage many large computer installation projects as an IBM Systems Engineer. Managing a project schedule is not about the tool as much as going about your work appropriately and in a manner that works. This organizes the tasks into logical groups and saves time when you work through a project status meeting to determine the status of this week’s tasks that are due to be completed. My approach is to quantify the tasks to complete a project first. I focus on identifying and listing all the tasks first and then work from there. Something else to consider as you develop the tasks is that some tasks will be bottlenecks or key tasks that can jeopardize your project if they are not completed on time. You want to identify bottleneck tasks as quickly as you can and place priority on getting them completed early. Eliminating a bottleneck may actually give you a time advantage. 2. 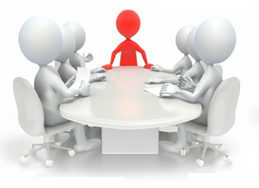 Responsibility – Each task needs one person assigned to be responsible in getting the task completed. It doesn’t have to be the person who actually works on the task, but it needs to be someone on the project team who sits in the weekly status meetings so you can look the person in the eye when you hold them accountable for the task. Another note on this, , , keep responsibility for each task to 1 person, even if multiple people work on the task. It’s hard to hold more than one person truly accountable for a task and it’s easy for them to point at the other person if a task is not completed. 3. Timeframe – These are the columns you see titled Month-1, Month-2, etc. Under each month, there are 5 columns. These are weekly columns for the month, , , five because some months have 5 weeks. I use Friday dates. More on this in a second. So, let’s say the project starts in January and the first Friday is the 7th. I would put in the weekly columns: 7, , , 14, , , 21, , , 28 underneath the month of January to designate each of the Fridays in the month of January. Put in the Friday dates for the other months that are required to complete the project. Once you have the week ending dates established, , , work through each task to determine the week the task needs to be completed in order to complete the project successfully. What I do is to key or write in a “/” (slash). When the task is completed, I change the “/” to an “X”. This creates a visual effect that makes it very easy to see the status of all the tasks. You will see an example of this in a minute. 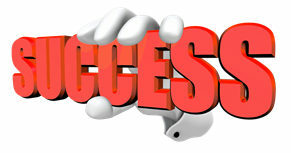 You may have a very large project, , , 20 pages or more with hundreds of tasks. 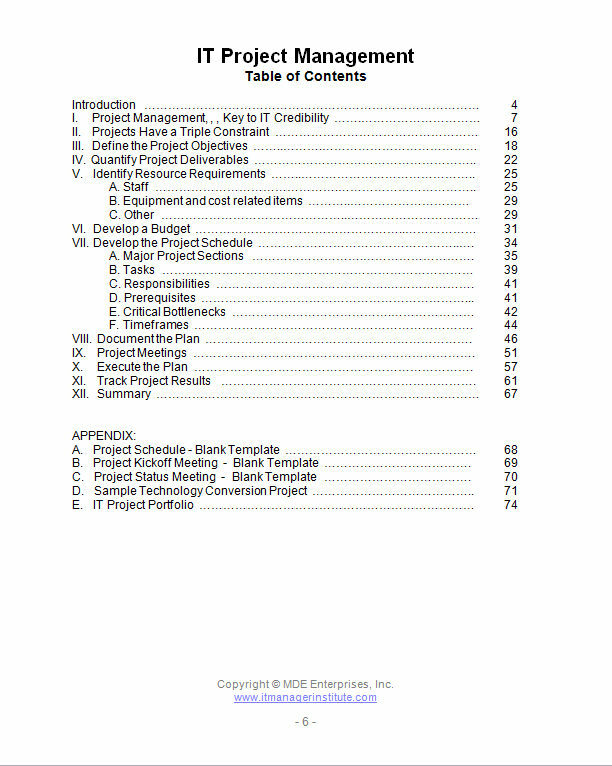 By using the “/” and “X” notations, you are able to work through a project status meeting quickly and thoroughly. You just focus on the tasks that are due this week and possibly next week plus bottleneck tasks you know exist in the future. I mentioned bottleneck tasks earlier. You may want to highlight these by shading the cell background of the completion time to bring attention to the team that this is a key task that can cause the project to fail. It also makes the task easy to spot in status meetings so you can ask about its status weeks ahead of when it is due. Remember the point I made earlier, , , get after these bottleneck tasks quickly! I also mentioned that I use Friday dates. Friday is the last day of the work week in the US so I show the tasks as needing to be completed by the end of the week. I hold my weekly status meetings early in the week on Mondays or Tuesdays and as we work through this week’s tasks it gives us a few extra days to complete a task if it’s not already completed. Project managers have to push the project to completion, , , it’s not going to be completed on time if you don’t push to make it happen. By holding project status meetings early in the week and showing tasks required to be completed by Friday it gives you additional time. 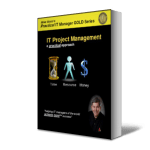 Quite often, project team members will procrastinate and wait until the last minute to start focusing on their tasks, , , they think they have plenty of time. This can cause a project to fail because sometimes a task is bigger or more complex than anticipated and takes longer to complete. The additional few days after a project status meeting will help you keep the project on track. Below is the first page of an actual project where you can see the visual effect of what I described in designating completed tasks with an “X”. You can easily see that we are about to hold a status meeting for the week of October 19th. Click on the image if you need to see a larger version. In the next post we will talk about communicating the status of active projects and I’ll share a simple tool I developed and used recently to do this. 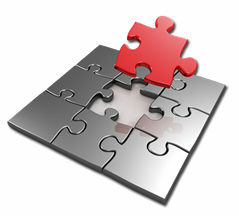 Managing projects does not have to be complex, , , the simplest of tools can be very effective. While there are plenty of tools you can use to keep track of everyone’s tasks and responsibilities, here is one that is easy to use and understand. I’ve been using it since my IBM days in the late 1970’s, , , before spreadsheets and PC’s. I still use it today and teach others how to use it to deliver projects successfully. You don’t throw something away when it works well and gets you positive results. Fill in the Project name. 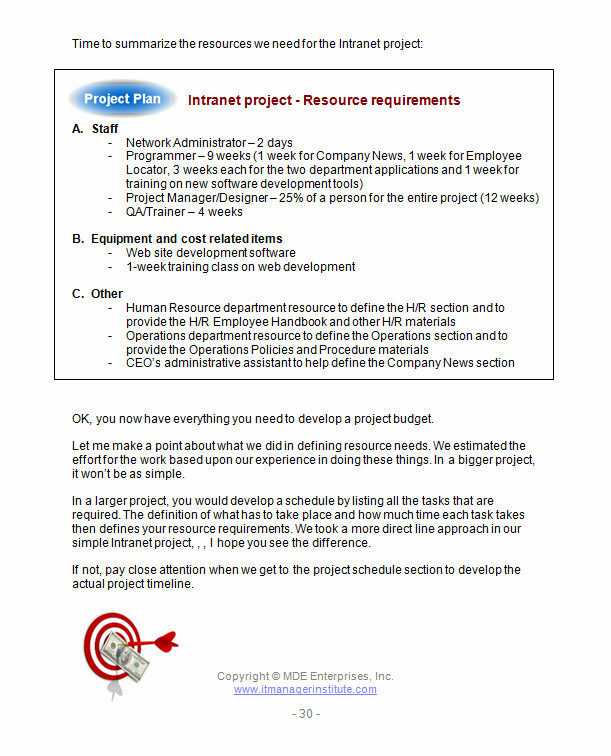 Fill in the Project Manager name and contact information (e-mail, phone number, etc.). Fill in the month at the top of the column groups (Jan., Feb., Mar., etc.). Fill in the week ending dates for each weekly column. There are five columns for each month to provide for five-week months. List the tasks required to complete the project. List the person responsible for each task. Place a slash mark (/) in the cell of the week in which the task should be completed. List the resource participants and their initials at the bottom of the first page for reference. 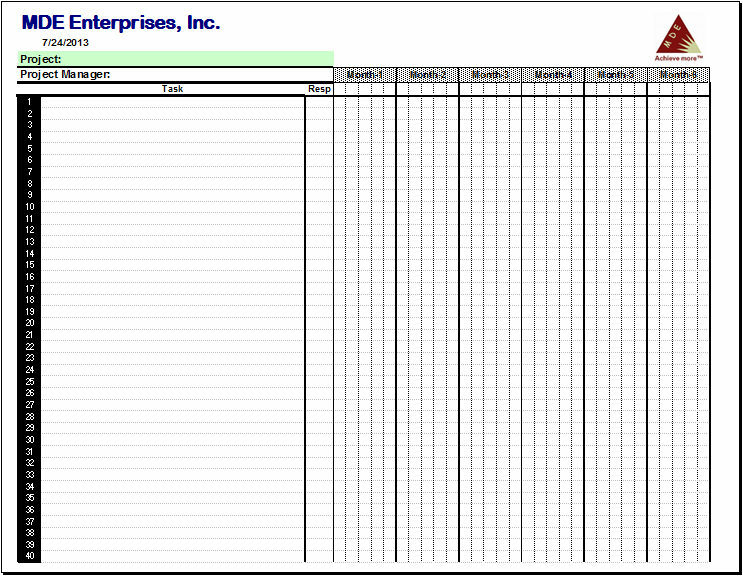 CLICK HERE to download the Excel spreadsheet tool. Do you know what “project scope creep” is? Who do you think are the main cause of scope creep in your company? Scope creep happens after you define the scope and deliverable of a project and make a commitment to deliver it. As your team works on the project, over time you discover your client’s expectations of what you will deliver has increased, , , in some cases quite substantially more than what the original project scope was defined to be. Here is an example. Your original project to develop a new software feature was going to take 300 hours but 60 days into the project the client thinks you are going to develop functionality that will probably take 500 hours, , , your project has mysteriously grown by 40%. As a result, your project will not be successful, , , you will either deliver less than expected or you will complete the project much later than expected. Why did this happen and what caused this huge increase in scope, , , better yet, who caused it? The phenomena of scope creep comes back to “who caused it”. Most think the client is the culprit. It’s usually not the case, , , most of the time scope creep is caused by your own IT people. That’s right, , , we are the primary cause of scope creep. It is like “shooting ourselves in the foot”. Here is what happens. Your people, in this case programmers and business analysts, are very bright and conscientious people. They want to do a good job for your clients. As they begin working on a software feature enhancement to address a client issue, they think of things that could make the product even better, , , little things, mind you, , , but great ideas that will help the client beyond the initial scope of what we originally agreed to do. Before you know it, the client is all excited about what he is seeing and hearing about his new software feature. As parts of the code are completed, more discussions take place because the programmer and business analyst identify additional things that can be done to improve the situation, , , all good things. The problem is that these “good things” add work to the project and will make the project run longer and cost more than originally planned. In many cases, these discussions take place in the background and the project manager is not even aware he is literally being set up for failure, , , albeit unintentionally and more of people trying to do good things for the client. Coach your employees and teach them about scope creep. You want them to be creative and to come up with good ideas, , , you just need them to bring these ideas to the project manager first to discuss them, , , not to get the client all excited and have his expectations get out of line with what has been committed to. If the idea has value, we will take it to the client together to evaluate the situation. If it has enough value to change the scope of the project, we will do it in a way that will manage the client’s expectations as to delivery date, cost, etc. Teach your employees about scope creep and ensure they understand there are only two people who can add additional scope to a project, , , the project sponsor or the project manager. All good ideas need to go through one of these two people. 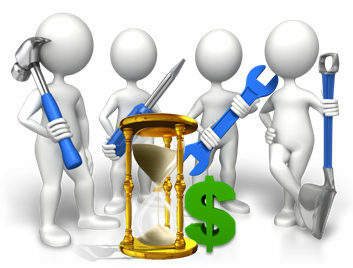 Projects have to be managed and one of the elements of project management is to manage scope creep.